As a fanatic about what goes into my mouth, believing in better-snacking options, I am all about fresh produce, and healthy foods that don’t wear me down. Whatever I eat, has to fit my lifestyle meaning that it has to be fast, easy and healthy. I love simple foods, with simple ingredients that taste outstanding. Inspirational foods are those that are simply rinsed, cut or sprinkled or a combination of these. Keeping food simple, allows me to enjoy the fullest taste, the boldest flavors and of course feel satisfied through dipping and dunking! My ideas for farmer’s market inspired snack options have grown out of my love for shopping at our local farms while returning with simple vegetables and fruits and they want to keep things simple, and pure. 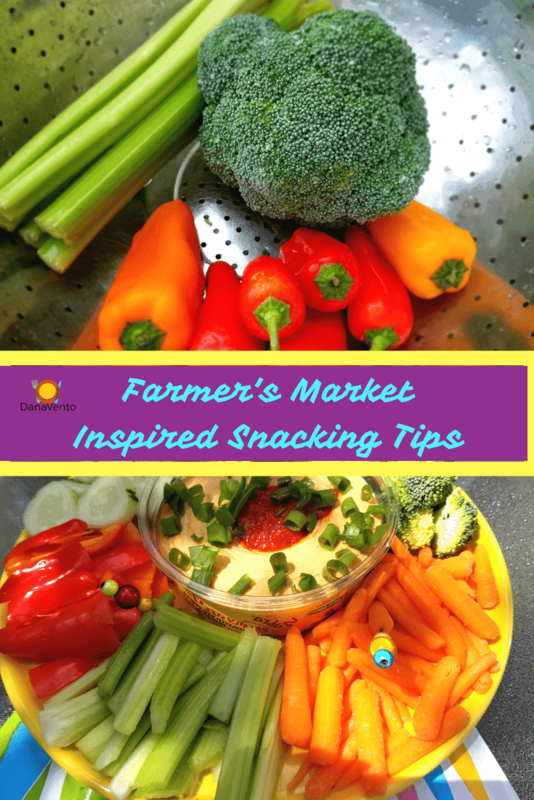 Lavishly live food out loud, and great ready to dip, dunk, slice, peel and sprinkle it’s time to indulge in my farmer’s market inspired snack options! Stock up your kitchen with a great peeler, a solid knife, a colander, a roll of paper towels, fresh herbs, spices and plenty of fruits, veggies, and granola! These are the magical items that will allow you to keep the food you buy real, simple and delicious. Who’s ready to rinse, peel, chop and create delectable healthy snack options in just seconds? You can choose any hummus you like, just make sure the ingredients are minimal then dunk away! We often make our own, but many prefer to buy so here’s an example of how gorgeous good food can be! Pick brilliant colored produce, and be sure to rinse it all. Cut it, chunk it, peel it, and put it on a tray. The more variety the better, after all, veggies are great when they are fresh and crisp! Dunk away, it is good for you! Use a bright and colorful platter to really let your veggie platter pop and look authentically Farmer’s Market. Place the veggies around the Hummus and top hummus off with chopped green onion tops. Really push the depth of dunking and load that carrot stick. If you are dunking celery make the dunk count, don’t be cheap with it. You will love the taste! The crisp crunch of the vegetables against the smooth taste of the hummus is great! Heck, it even gets under my fingernails when I get into dunking mode. You may start a trend, as others see you dunking, they may scamper to get into what you are doing. Now, don’t forget if you are at a picnic to smear some hummus across a burger, it is way better than mayo and a lot healthier too! Shopping trips to farmer’s markets keep me inspired, and in fact, when I travel to our local farmer’s markets I stock up on veggies because there’s nothing like fresh. Simple is as simple does and I don’t believe in adding any extra additives, so natural mix-ins and easy to create veggie dunk-ins for dipping is how I keep it easy and delish. Lavishly live food out loud and use my ideas for Farmer’s Market Inspired Snack Options. Happy dunking and dipping! We like to do sweet bell peppers and dips like ranch or hummus. These are yummy options! I really love Sabra hummus. It truly does make for the perfect snack option! I am wondering if that’s hummus is spicy? It looks really tasty, would love to try it. This is really veggie good! A nice snack for all ages because it has the nutrients that our body need! Great idea! Worth to share. Aileen Adalid recently posted..Making Unique ‘Sampuru’ in Japan’s Fake Food Capital: Gujo Hachiman! Great…now this made me hungry! I need to go get a snack! I absolutely love Sabra! Hummus is my favorite snack and pairing it with fresh veggies is the best. I need to get to the farmer’s market this week and grab some Sabra. I love the Farmer’s Market this time of year since those little cukes are so wonderful. I often bring Sabra with cut up veggies to gatherings. Those are awesome ideas. Most we already enjoy. I love serving veggie n dip whether it be hummus or other is that there is something for everyone to chose from. My favorite is broccoli crowns dipped. This Sabra’s product looks so tasty!